In my eBay experience, I’ve learned a couple of lessons. The most important one of all is to watch your back! This goes for both buyers and sellers. Have an edge or a safety measure over the person with whom you are dealing in an eBay transaction. For buyers, this is easy. Participate in auctions that have a PayPal Buyer Protection Program. In this program, the transaction is covered for up to $1000. Use a credit card. So, if something uneventful happens, say they don’t send the item, you can do a credit card charge back. Sellers, it is a little more difficult to protect yourselves. I mean, the “customer is always right,” right? Use PayPal and take advantage of the Seller Protection Policy for up to $5000 against chargebacks. Before sending big-ticket items, make sure that you are acting in compliance with the stringent rules outlined in the user agreement. Trust me, I know what I’m talking about. I was disqualified for the Seller’s Protection on one of my expensive sales because I didn’t ship with Signature Confirmation. Use insurance, delivery confirmation, and/or signature confirmation so that if a buyer complains of loss shipment, you have proof of delivery and/or coverage. For both buyers and sellers, there is a common, equal leverage that each party possesses. That power is character defamation, or the feedback system. All eBay users have a feedback rating. Initially, after signing up for an account, everyone starts at 0. 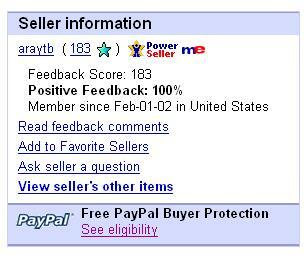 Each party in every completed eBay auction gets the opportunity to rate the other positive, neutral, or negative with a comment. I try to abstain from leaving negative feedback because I know how hard it is to raise a good score and how easy it is to ruin it. But, there are times when leaving negative feedback is a must. The problem is that 9 times out of 10, the other party will retaliate and do the same thing back to you. There is an easy way to avoid this seemingly-inevitable situation. Though, it requires a lot of patience. Basically, you wait about 90 days (it may have changed) after the bad eBay transaction. On the 90th day, leave negative feedback. The next day, the other party will be unable to retaliate and leave a bad comment because eBay has a set time window for leaving feedback. Just like in last-second eBay auction bidding, you’ve got to “snipe” feedback in order to get what you want. This entry was posted on Thursday, January 26th, 2006 at 8:23 pm	and is filed under Buying and Selling. You can follow any responses to this entry through the RSS 2.0 feed. You can leave a response, or trackback from your own site.